Kayla and Lucas chose their wedding date because of its historical importance to them. With it being a couple weeks into the official start of spring, they had hoped this would mean a spring wedding. Our weather this year had other plans! 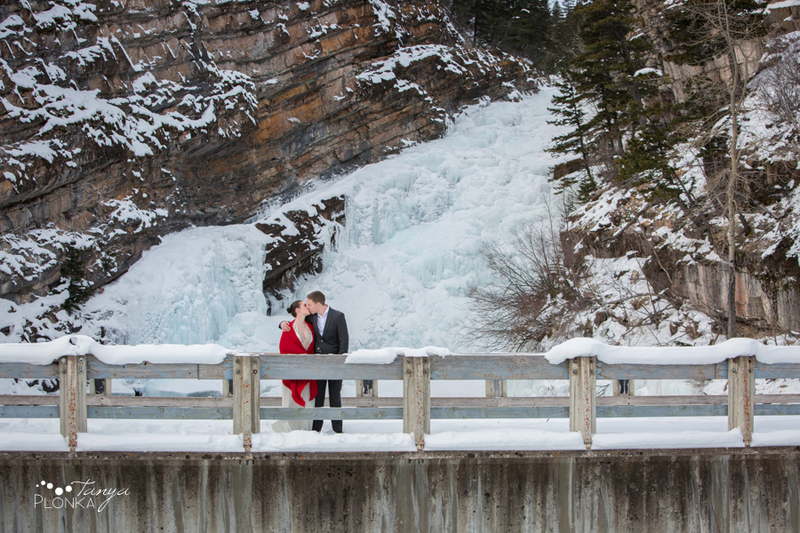 We instead spent the day taking snowy Waterton elopement photography. Waterton has received so much snow this year that there is an entire residential street that is closed due to avalanche warnings. Within the town, you can walk up to the rooftops of many buildings thanks to the drifted snow banks. We were a little limited for locations unless we were to snowshoe, try bouldering the 10 foot banks from the snow plows, or chisel away a new tunnel. Instead, we went for the easy choices of Cameron Falls and the Prince of Wales Hotel (which were still a lot harder to navigate than normal!). We first met Kayla and Lucas, their baby boy, and their friends at the Waterton Lakes Lodge to get a few indoor photos before faces became flushed from the cold. Once outside, Kayla and Lucas had no trouble snuggling in close to stay warm! Honestly, I think they would have snuggled just as hard had it been warm out, judging by the adoring looks they gave each other all day. 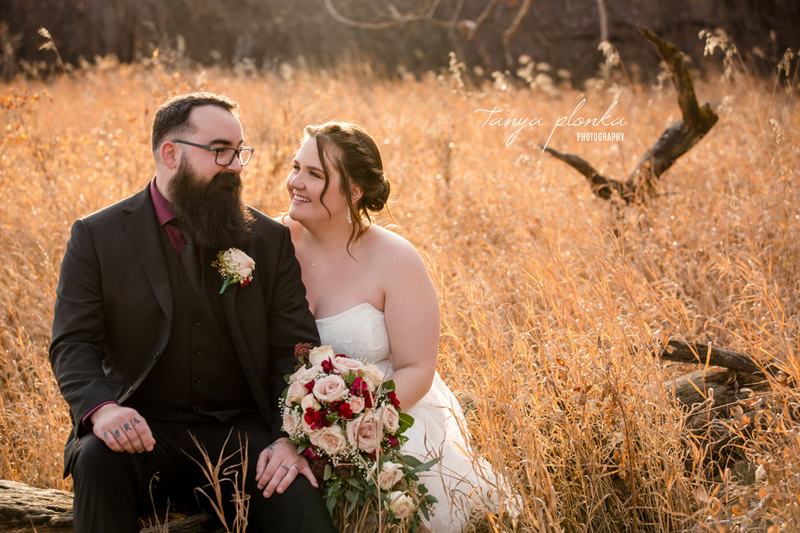 They held their elopement ceremony on the front stone steps of the Waterton Community Center. Their baby was a champ in the cold and made it through all the photos at Cameron Falls as well as half the ceremony before he had had enough! Kayla and Lucas were so lost in their vows that they didn’t know how cold their fingers and toes were getting until after their first kiss. Mandy and Chris had an intimate Southminster United Church chapel wedding in the evening. They included so many unique touches in their ceremony. In place of a sand ceremony, they poured their favorite gummy candies together with their boys, and at the end served their guests champagne in custom flutes with a toast to their friends and family. 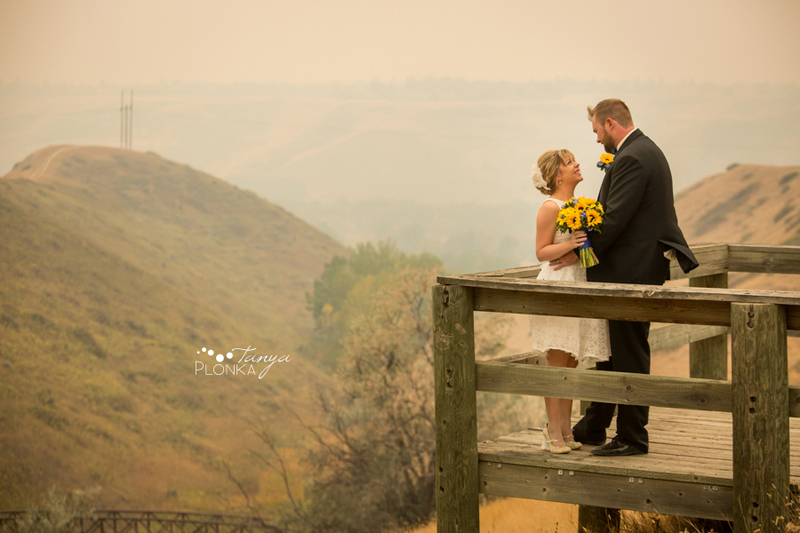 Despite the smokey air, Mandy and Chris were in amazing spirits and so elated to be in each other’s company. Mandy was constantly bursting into happy laughter whenever Chris held or kissed her! It’s already an honour to be asked to take part in such memorable days in people’s lives, but even more so when that day is exceptionally intimate. 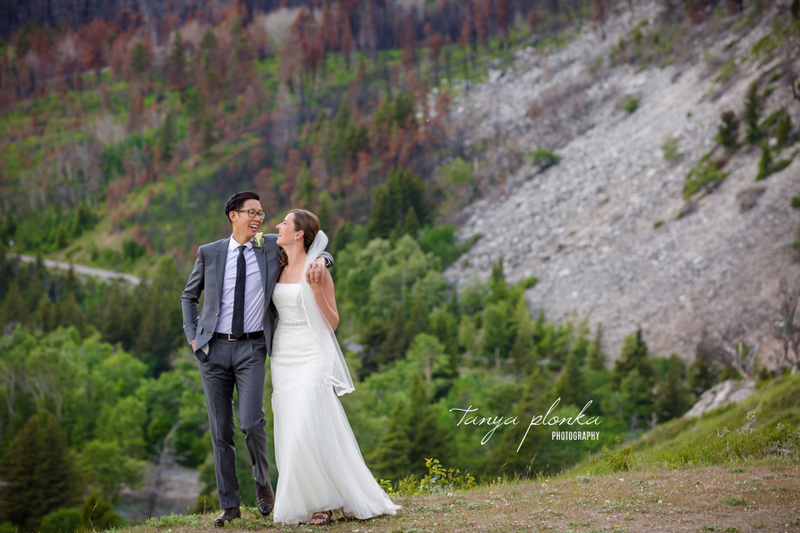 Becky and Ryan travelled to Waterton all the way from the Eastern US to have their Prince of Wales wedding elopement. Only the two of them, myself, and their officiant were present for the beautiful ceremony. (I won’t count the group of tourists yelling about a bear in the distance… they were far enough away!) They took their time to take in the scenery, sharing many quiet moments together most couples don’t have a chance to experience during their ceremonies. As much as they have a quiet, nurturing presence around each other, they also have a silly side that I loved to see. Their hiking boots were a perfect touch to bring their interests into the photos AND make climbing into the canyon that much easier.